Purpose: While intraoperative shedding of circulating tumor cells (CTCs) is a common occurrence, the clinical significance of intraoperative CTCs in cancer cases remains controversial. 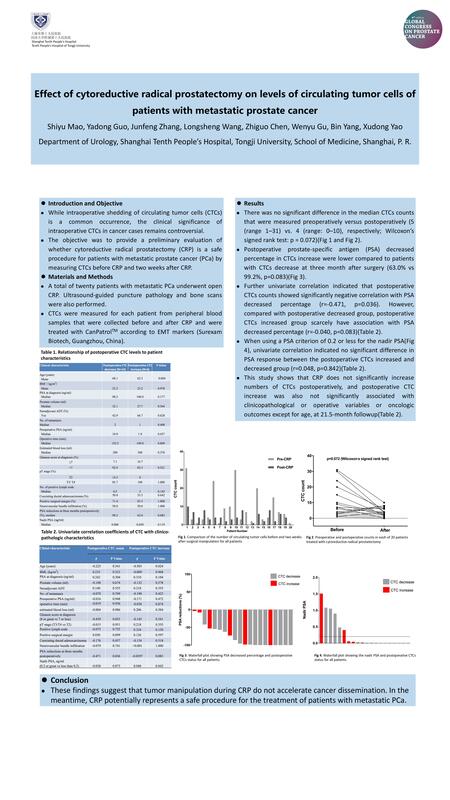 The objective was to provide a preliminary evaluation of whether cytoreductive radical prostatectomy (CRP) is a safe procedure for patients with metastatic prostate cancer (mPCa) by measuring CTCs before CRP and two weeks after CRP. 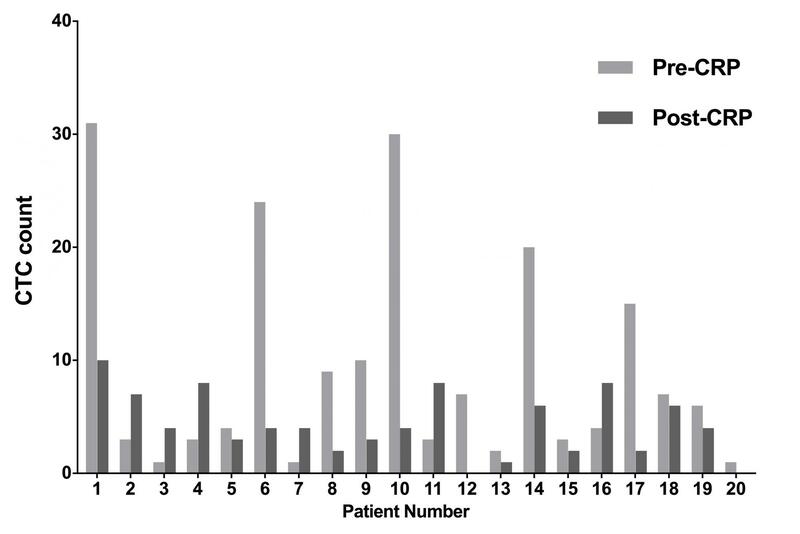 Methods: A total of twenty patients with mPCa underwent open CRP. Ultrasound-guided puncture pathology and bone scans were also performed. CTCs were measured for each patient from peripheral blood samples that were collected before and after CRP and were treated with CanPatrolTM according to EMT markers (Surexam Biotech, Guangzhou, China). 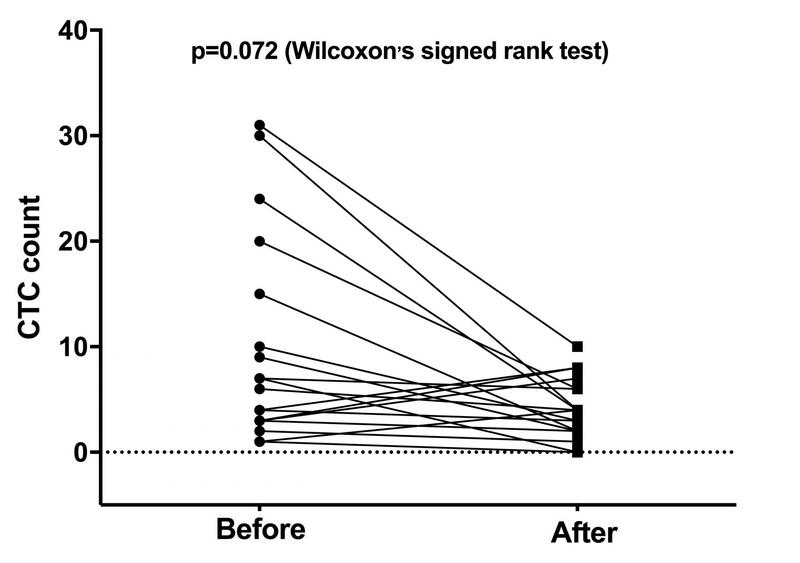 Results: There was no significant difference in the median CTCs counts that were measured preoperatively versus postoperatively (5 (range 1–31) vs. 4 (range: 0–10), respectively; Wilcoxon’s signed rank test: p = 0.072). Postoperative prostate-specific antigen (PSA) decreased percentage in CTCs increase were lower compared to patients with CTCs decrease at three month after surgery (63.0% vs 99.2%, p=0.083). 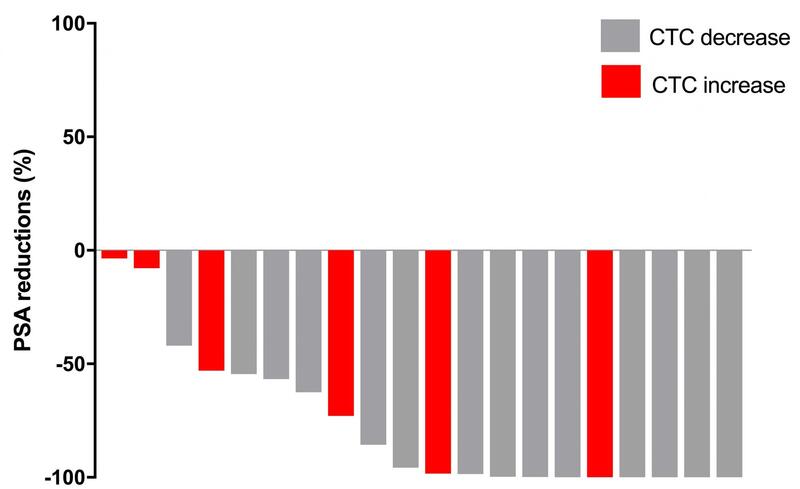 Further univariate correlation indicated that postoperative CTCs counts showed significantly negative correlation with PSA decreased percentage (r=-0.471, p=0.036). However, compared with postoperative decreased group, postoperative CTCs increased group scarcely have association with PSA decreased percentage (r=-0.040, p=0.083). When using a PSA criterion of 0.2 or less for the nadir PSA, univariate correlation indicated no significant difference in PSA response between the postoperative CTCs increased and decreased group (r=0.048, p=0.842). This study shows that CRP does not significantly increase numbers of CTCs postoperatively, and postoperative CTC increase was also not significantly associated with clinicopathological or operative variables or oncologic outcomes except for age, at 21.5-month followup. Conclusion: These findings suggest that tumor manipulation during CRP do not accelerate cancer dissemination. In the meantime, CRP potentially represents a safe procedure for the treatment of patients with mPCa.